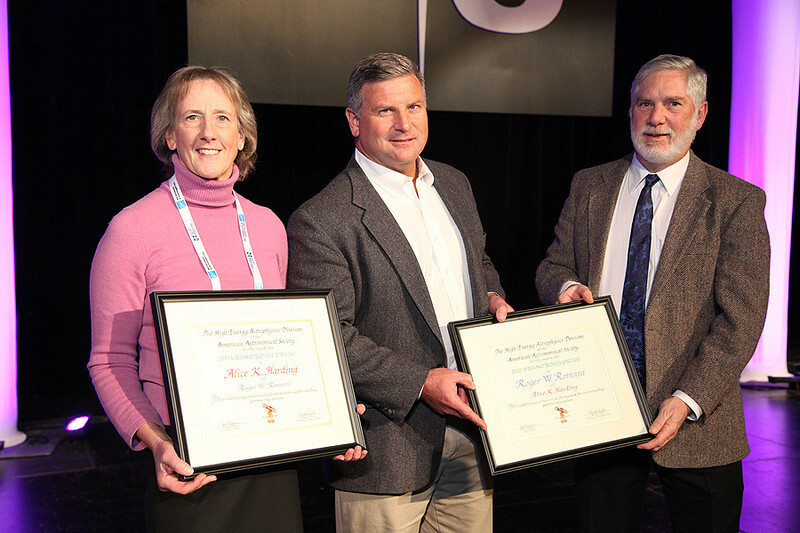 The High Energy Astrophysics Division (HEAD) gave its Bruno Rossi Prize to Alice K. Harding (NASA Goddard Space Flight Center) and Roger W. Romani (Stanford University) for establishing a theoretical framework for understanding gamma-ray pulsars. Splitting their Thursday-afternoon plenary slot, Harding presented "The Amazing Pulsar Machine," while Romani's lecture was "The Pulsing Gamma-ray Sky." HEAD chair Joel Bregman (University of Michigan) emceed the festivities. AAS photo © 2014 Joson Images.